President Jacques Chirac has ordered an inquiry into the leak of a French secret service memo claiming that Osama Bin Laden had died. Mr Chirac told reporters he was surprised the memo had been leaked, and refused to comment on the claim itself. A French newspaper quoted a document as saying the Saudi secret services were convinced the al-Qaeda leader had died of typhoid in Pakistan in late August. Officials in Pakistan and the US said they could not confirm the account. Saudi-born Bin Laden was based in Afghanistan until the Taleban government there was overthrown by US-backed forces in 2001 after the 9/11 attacks. Since then, US and Pakistani officials have regularly said they believe he is hiding in the lawless border area between Afghanistan and Pakistan. His last videotaped message was released in late 2004, but several audio tapes have been released this year - the last at the end of June, in which Bin Laden praised Abu Musab al-Zarqawi, the leader of al-Qaeda in Iraq, who was killed in an American air strike. In its report, French regional daily L'Est Republicain said it had obtained a copy of a DGSE foreign intelligence service report dated 21 September. 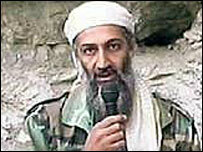 "According to a usually reliable source, the Saudi services are now convinced that Osama Bin Laden is dead," it read. "The information gathered by the Saudis indicates that the head of al-Qaeda fell victim, while he was in Pakistan on August 23, 2006, to a very serious case of typhoid that led to a partial paralysis of his internal organs." Mr Chirac said: "I am surprised that a confidential memo from the secret services has been published, therefore I've ordered the defence minister to start an inquiry. "As far as the information itself is concerned, it's not confirmed in any way. Therefore I have no comment at all." The Washington-based IntelCenter, which monitors terrorism communications, said it was not aware of any similar reports on the internet. "We've seen nothing from any al-Qaeda messaging or other indicators that would point to the death of Osama Bin Laden," director Ben Venzke told the Associated Press news agency.